Way back when I first did the benchwork for East Berlin, I'd decided to transition from cork roadbed to just laying the track directly on the plywood. So, on one side of the bridge (south/left) there was cork, and on the other side of the bridge there wasn't. Consequently, in order to keep the bridge level, the plywood on the north/right side was higher than the plywood on the south side. Now that I'm working in this area again and giving it more attention, I decided - since the "Berlin Main," though cut back, is/was still "main track" - it should be elevated, and the industrial siding ramp down from there to ground level. Of course, that would require lowering the plywood base in the area (right/north of the bridge) in order to allow for the height of the cork roadbed while keeping the track level. Rescrew the risers at the new height and rescrew the fascia back in place. 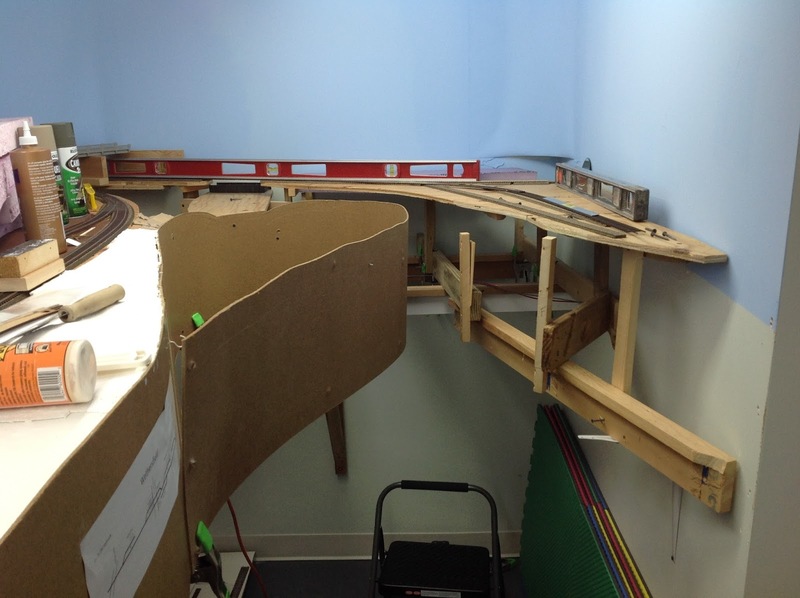 Then I glued down the new cork roadbed, holding it in place with pushpins (see photo above, click to "embiggen"). All that took only a little over 2 hours - and I made another little bit of progress. I don't even want to think of what would have been involved if I had wanted to try and do this having used something other than L-girder benchwork. 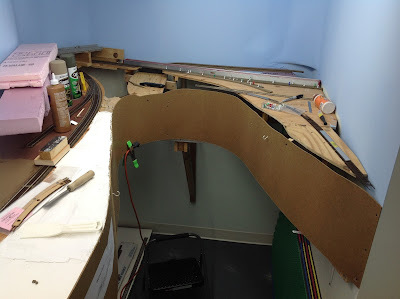 There must be other reasons it's such a tried-and-true construction method for model railroads, but my experience (or, rather, "experiences" considering how much I rebuild, apparently) has certainly convinced me it's a great way to go for a larger layout.